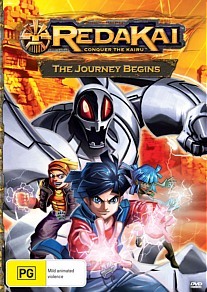 Redakai the Journey Begins DVD Review I would only recommend this series to parents whose kids already have the cards or game or whatever they are selling as my kids don't have them and they found it too confusing. I didn't like this show at all, and to be honest my kids who are absolutely the target demographic for it being aged 8 through 11 both boys and girls, didn't either. The series expected a lot of us as viewers and the fact that it appears to be primarily aimed at sucking kids into buying the toys or cards or whatever was pretty transparent from the get go. Considering the pedigree that this series comes from (same creators as Bakugan), I would have thought that there would be a lot more back story and explantion but alas no. I was pestered all the way through watching by the kids wanting explanations that I simply couldn't give. Bear in mind that we sometimes only receive a DVD, not the casing and other packaging that could have helped both with presentation and explaining the story a bit. Here is what I came to understand from this viewing, it's up to you to see if you care enough to follow me to the bitter end. And yes I am a bit bitter about this show. I love cartoons so it's certainly not a genre thing that hurts this series and I also like toy/cartoon tie ins. Anyway, I digress. Kairu energy has dispersed around the earth and as it is a source of power for Kairu fighters both good and bad, it is a desperately fought over resource. Our trio of heroes can harness Kairu and by using a device that brings up cards, they can use Kairu and either become that creature or harness the powers of it. It's at this point that the card game element became apparent as these cards hover around the kids and they work their way through them in some of the slowest most annoying battle sequences I've had the misfortune of watching. It's about as slow as watching someone else play Final Fantasy during a fight. Yes that bad. The way that the series is drawn is pretty good and quite honestly the highlight. The animations are crisp and the way that the cards appear like holograms in front of the Kairu warriors does make you want to duck out and buy a pack, secure in the knowledge that there is no way in hell they are going to look that cool in real life. Sound is nothing special, but nothing to complain about either. It's only stereo so don't expect to feel immersed. I would only recommend this series to parents whose kids already have the cards or game or whatever they are selling as my kids don't have them and they found it too confusing.